What Holiday Flea day is right for you? When we move indoors, for our Holiday Market Season, we get a lot of questions about how we choose to set this whole experience up. Why do we charge? Well that's simple. When we move inside, we go from over 50,000 square feet of real estate to much smaller, in this case, 20,000 square feet. When we go inside, we're limited by space. In order to keep everyone safe AND deliver you all the predictable experience you want, we turn each day into it's own adventure. Friday is Party & Shop, Saturday is Classic Flea Experience, and Sunday is Brunch & Shop. You see, if everyone showed up at the exact same time, 80% of you would be waiting out in the cold. Because that's how occupancy works. Only X amount of people are allowed in at once. So, our solution? Plan 3 fun days that will deliver you each the experience you want! So, just pick one and you know you get in the door! What if you don't want to pay? That's totally fine! Saturday from 1-5 and Sunday from 10-5 are totally free! BUT you run the risk of waiting in line. The only way to guarantee you won't be waiting in line is to book one of these tickets. So, here's a little behind-the-scenes about how we set up Holiday Flea but also how you can choose the best market for you. If you're someone who likes parties, super-special food experiences and Night Markets, you'll want to choose our Friday Holiday Preview Parties! Tickets are $20 and we're doing all sorts of special things that are only available on these select Fridays. First access to all the best items of the flea. Many vendors bring their best items and only limited quantities of these items, so if you want the best of the best, show up on Friday! Our Pop-Up Party Food Series with 4 themed parties. This month we're offering Dinette, a classicly modern look at Diner Favorites like mac 'n' cheese, French silk pie and party-style meatballs. (other flea food will be there, too, like Pierogi Lady, Spice Kitchen and more. There will be enough food there to eat dinner, or just have a snack if that's what you're looking for. Friday tickets are extremely limited and you'll want to grab yours soon if this is the Flea Experience you're looking to have. $20 gets you access to all the special party moments + all the best shopping! This is by far the most popular day, because people are used to it. It's obviously a lot of fun to start your day in the Flea way (coffee, donut, music, lots of other people) and it's why we've ticketed Saturday Mornings between 10am-1pm. We WANT you to be able to have the experience you want, not show up and stand in line waiting for an hour to get in the door. So, if you're into having a more classicly-flea Saturday Morning experience, just get your tickets in advance and you won't be left standing out in the cold! Tickets are $10 and kids are free but we do want you to list that you're bringing them. What makes Saturday Morning special? Well, Saturday is the classic morning experience that we're all used to! From 3-6pm the crowds typically die down, so if you're someone who likes to shop when everyone else has been shopped out, then you should spend Saturday afternoons with us! Grab one of our 5 cocktails and shop without all the energy of Flea Saturday Morning. The signature cocktails + best food options might be sold out by then, but that's typically cool with you. You're just looking to grab snacks and do some fun shopping in a low-stress environment anyway! What makes Saturday Afternoon special? Cocktails + Snacks by Flea Bar and a handful of our favorite food vendors. Who doesn't love Happy Hour?? Did we say less crowds? No planning required, you just show up + shop. We can't guarantee you'll breeze right in, but typically this is a good time to get in and avoid lines. 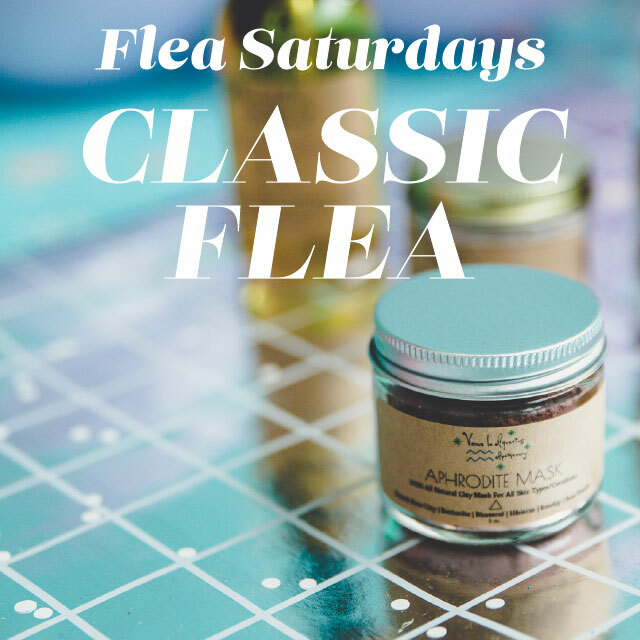 FLEA SUNDAYS: Brunch & Shop! Sundays at the Holiday Flea are filled with the scents of bacon and pierogi and eggs sizzling, the sounds of chill music, toast popping up for our Toast Bar by Cleveland Field Kitchen and bottles of champagne popping at The Flea Bar. It's Brunch, y'all! Special Sunday brunch menu by The Cleveland Field Kitchen who's running a collaborative booth with us called Luncheonette! Reinvented Diner Classics that you won't get anywhere else! It's going to be fun and full of families, but it's not as hectic at Saturday morning. No planning required, you just show up + shop. We can't guarantee you'll breeze right in, but typically this is a less busy day than Saturday! Last chance to get all the shopping! It's fun for the entire family. We'll have a kids area for some crafting fun, plus we've got all the fun shopping and music and beer for the parents! We hope this guide has been informative and has helped you Choose Your Flea Adventure! If you missed it before, take our fun quiz to see what type of Flea Shopper Personality you are! We'll see you at our Opening Weekend, friends! WHICH FLEA SHOPPER ARE YOU?